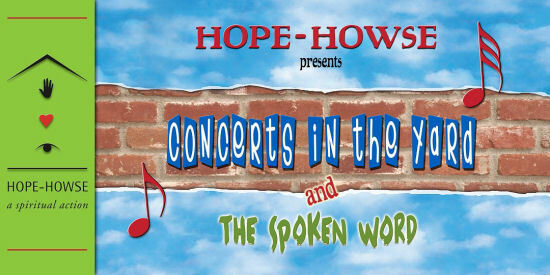 Once a month "HOPE-HOWSE presents Concerts in the Yard and the Spoken Word" takes place at the Penitentiary of New Mexico. This banner was created by John Cavanaugh and printed by Paper Tiger supporting our work in the Santa Fe community. Thank you to all who are part of this new series. Here is the schedule of musicians. ALL are donating their time to this great project. One of the musicians said, "I think I'm getting paid far too much for this gig!!" If you want to come play in the prison with us please contact HOPE-HOWSE. April 21: Tom Lagana - co-author of "Chicken Soup for the Prisoner's Soul"
On the first Friday of each month we sponsor the Haciendola's, the Hispanic self-help group on the Penitentiary of New Mexico. On the 2nd Saturday of each month, we sponsor the Black Awareness Group (BAG), a self-help group in the penitentiary. On the third Wednesday of the month we bring in musicians who also donate their time and talent for "HOPE-HOWSE presents Concerts in the Yard & The Spoken Word." On the 4th Thursday of each month, we sponsor the Gray Eagles, a Native American self-help group of prisoners in the penitentiary. We use writing as a tool for healing and have a number of on-going, diverse programs and workshops. There are currently two writing programs in two women’s prisons in Georgia. For additional information or to schedule a talk in your home or community please contact jane@hope-howse.org or (505) 983-6677. "It opened a whole new area in my mind and my life I didn't know existed. It has allowed me to be able to express myself in words." "The writing group has been a new challenge for me. I'm looking forward to attending the group." "Encouraging...let's me know that I can still turn my life around and make a difference in this world, whether through words...art...expression. It has also taught me that, through others' stories, out of any tragedy or difficult circumstance, at the end of that road is a beautiful beginning." "This group has done a lot for me. I've tried to surround myself with positive things and positive people. This group has provided another outlet for me to do that." "Being part of Mark My Words has changed my life for the better. The women in the group are my greatest teachers. They teach me about hope, strength, and being positive in a very negative place. Through our writing, we continue to bring light to the darkness that surrounds them." Miriam is a world-renowned singer and songwriter and activist for peace  first in our hearts. She is on the Board of ALL NATIONS CAFÉ bringing Jews, Muslims and Christians together in song, dance, chanting and breaking bread. BRING YOUR DRUMS, FLUTES, GUITARS OR OTHER INSTRUMENTS!! !